Incredible videos and photos can be found of it. Thousands of starlings that are close together flying through the air in huge groups, where the swarm shows all kinds of dazzling shapes and movements. It seems like the whole flock is one living creature. The starling (Sturnus vulgaris) is 22 cm. He looks black and has a purple-green glossy plumage and a short tail. After the molting in the summer he wears a pale autumn dress with pearl dots that in winter wear away to just black. It is a migratory bird that we can see here all year round. That's because the northern ones descend here, and ours move on to the warmer south. Large troop movements may be there from September to March. This group formation for the migration is done step by step. Every day there are new travelers that connect to the pack. This eventually leads to the familiar starlings clouds. To the sleeping spots tens of thousands of birds sometimes descend. In Danish this is called Sort Sol. In English this is called Black Sun, or murmuration because of the noise. Why they are so massive gathering is for ornithologists still not clear. By analogy with other animal species (mosquitoes, fish, zebra ...), it is assumed that the individual is more secure in the group. A robber has it harder to concentrate on one individual. Because they are not really safe this way. Their deafening group chatter certainly attracts attention from far, probably also of birds of prey. The British biologist Wynne-Edwards assumes that starlings want to assess how many there are, in view of the amount of food which is available at the circumference. In the group each bird tries to fly as close as possible to its neighbor. He also copies as much as possible any change immediately. By the size of the group that provides spectacular movements. A small change is amplified by thousands and ultimately provides an impressive and dazzling picture. 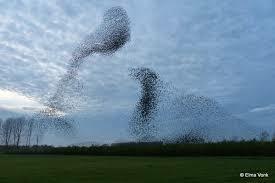 According to ornithologist Paul Stancliffe the number in a flock of starlings can grow to one million. The air is then really black of starlings. Until almost frightening. The varying density of dots draws moving patterns in the air. A great spectacle, a collective dance. The huge, smooth moving cloud dances back and forth. Not only in the air but also sleeping on the ground and in the trees they provide an impressive ballet, a fascinating starlings spectacle. No one wants to fall outside the group. Or would be landing the first on the ground or on a branch. They remain ever twisting and turning without ever to clash. Whether this happens and we do not notice it? Interested photographers should bring an umbrella to protect them self from the falling poo.